Copper is a soft metallic elemental mineral. It is represented on the periodic table of the elements by the symbol Cu which stands for the Latin word for this red metal, cuprum. It is an excellent conductor of electricity and heat. That makes it very useful to humans. Today it is used more than ever. We use it especially in electronics, wiring, and piping for our homes. It is needed by both plants and animals in small quantities as a nutrient. It is also used as a poison especially as a fungicide. This metal is usually mined from large open pit mines. 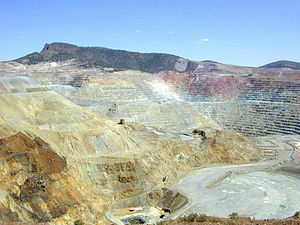 The ore taken from these mines is usually a form of copper sulfide mostly chalcopyrite or chalcocite. It is only ½ to 1 percent copper. There are many steps needed to remove the copper from the ore. The world’s supply of copper is produced by a small number of countries. While many countries have mines only a few produce significant amounts. Chile is the leading producer. The United States is the second largest producer followed by Peru, China, Australia, and Indonesia. 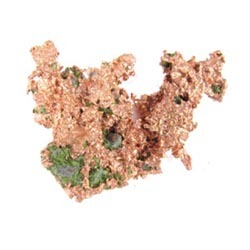 In the US Arizona, Utah, New Mexico, Nevada, Montana, and Michigan all produce significant amounts of copper. This red metal has been used by humans more than 10,000 years! Artifacts found in Iraq have been dated to 8,700 B.C. In ancient times copper was used because it was easy to shape and could be made into pots, pans and containers of all sorts. People have discovered and used this metal independently in many places around the world. China, the Americas, the Middle East and Africa All developed copper industries on their own. The earliest uses involved shaping native copper. Later the smelting process was discovered. Mixing copper with other metals greatly increases its durability and many alloys were created, including brass and bronze.